Migraine is a particular type of severe headache, sometimes with visual disturbances and nausea or vomiting. It affects one in four women and one in 12 men in the USA, and usually begins in young adulthood, although it's not unheard of for patients to experience their first migraine after the age of 40. There are two types: classical migraine, where you get warning signs, known as an 'aura', and common migraine, where you don't. Migraine can be very debilitating, lasting for hours or even days at a time. Some sufferers have to take to their beds as they can't function with the severity of the pain. Episodes can occur regularly or infrequently. In pregnancy, some moms-to-be who have never experienced migraine suddenly start to suffer – usually in the first trimester – whereas, conversely, expectant moms who were previous migraine sufferers often find they don't experience migraine throughout pregnancy. A few previous migraine sufferers find their symptoms worsen in pregnancy. Migraine in pregnancy is thought to be caused by fluctuating hormones, dehydration, sleep loss, fluctuating blood sugar levels, some food triggers, stress and, in some cases, caffeine withdrawal. 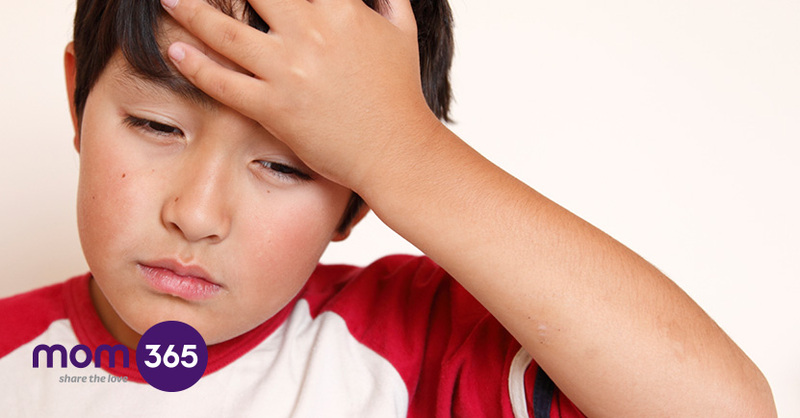 There is a complaint in children that's known as 'tummy migraine' (or 'abdominal migraine'). Also known as 'periodic syndrome', children who suffer from these attacks usually have a family history of actual migraine. Diagnosis is usually made only after other causes of stomach pain have been ruled out. In classical migraine, the 'aura' can consist of a combination of visual disturbances, such as flashing lights or zigzag peripheral vision and a stiff neck and limbs. There may also be a sensitivity to light and nausea or vomiting. In common migraine, the symptoms are similar, but without the visual disturbances or stiff neck and limbs. The headache is often a throbbing pain normally concentrated towards the side of the head. In some people, migraine resolves after they've vomited; in others it fades gradually over a number of hours. A lot of sufferers report feeling exhausted and weak after an attack. In 'tummy migraine', symptoms include a tummy ache that lasts a few hours without any obvious cause. The child usually feels quite well between the periodic attacks. In a few children, other symptoms similar to actual migraine may occur. These can include seeing lights; feeling sick or vomiting; feeling dizzy and looking washed out. What are the treatments and remedies of Migraine? Although there's no cure for migraine, some people find painkillers effective in treating the symptoms, but the key is to take them as soon as the first symptom or sign of a migraine appears, otherwise they are much less effective. There are combination medications available over-the-counter specifically aimed at migraine, and these combine pain relief with anti-nausea drugs. If over-the-counter painkillers don't work for you, your GP may prescribe something stronger. If stronger pain relief doesn't help, triptan medicines, which are not the same as painkillers, may be prescribed. They cause the blood vessels around the brain to constrict, where migraine has caused them to expand. Triptans are available in the form of tablets, injections and nasal sprays, but may not be taken in pregnancy. It can take time to discover the right treatment for an individual migraine sufferer and it might be a case of trial and error before you find what suits you. Complementary therapies can be tried including acupuncture and homeopathy and relaxation therapies. The first line of defence for pregnancy migraine is prevention through lifestyle changes. It might be helpful to keep a food diary so you can identify and avoid any trigger foods. Trying to avoid stress, prevent dehydration and getting plenty of sleep may also help, as may eating small, regular meals to even out blood-sugar levels. Massage, ice packs and relaxation techniques might also prove helpful. If migraine is severe and persistent, there are some drugs that are considered safe enough for use in pregnancy, but these are best avoided unless absolutely necessary, and you will have to speak to your doctor about these. There is treatment available for tummy migraine, too. In some cases, a similar type of medication used to treat headache-type migraines might be helpful, but there are a few forms of treatment, so it may be a case of trial and error before finding the right solution for your child.